This place is a rural administrative and active market town with some remains of a castle dating back to the 12th Century. The Arab castle has been virtually destroyed leaving some walls still standing that are now surrounded by modern buildings. Like most other towns in the Algarve, most of the older potentially interesting buildings have been destroyed in the earthquake that occurred in 1755. 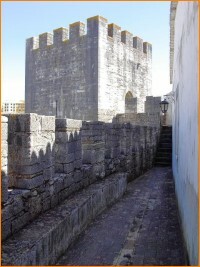 Within the remaining walls is a museum with an explanation of what was in the past the grandeur of the castle. The various earthquakes that it has suffered through its history have damaged the 13th Century Church of São Clemente. However, its Gothic arches and side chapels that are from the 16th Century have survived. 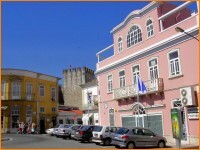 The town Loulé consisting of some 20,000 residents is mainly concerned in producing souvenir products made out of copperware, leather, cane and wood, or, servicing the tourist industry. 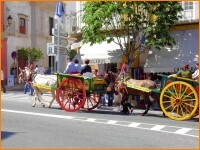 The weekly Fair attracts tourists from all along the Algarve. Due to the demands of the tourism this town has blossomed in size. An important event is the annual Carnival held in February that is considered to be one of the best in Portugal. In the town there is a Museum that is devoted to the local industry of dried fruits and it is interesting to see how these products are prepared for the public. To the west of the town is a hilltop Church that is built on the site of a 16th Century chapel. This is the destination of an annual religious procession that requires some physical effort on the part of the bearers of the church's religious shrines. Near to Loulé is Almancil a small town that acts also as a supplier of services to the prosperous holiday areas just south on the coast. Further inland is the small village of Alte, a village that is known for its un-spoilt rural architecture and its enthusiasm for folk music. Another inland village is Paderne that has a romantic 13th Century castle in ruins sitting alone on the crest of a deserted hilltop. The coastal town of Quarteira that was once a fishing village is now converted into a multi-apartment tourist location. 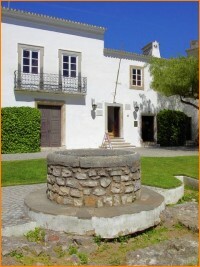 Not too far away from Loulé is the village of Querença with its stalactite caves. Also, the village of Salir with ruins of a castle and a nearby two 800 meters long walls from the Neolithic period. 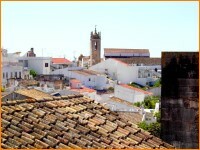 The small village of Benafim existing from Arab times and within easy reach of Loulé, still reflects rural life from the early part of the last century. This area has two added attractions in both the caves at Alto Fica and the rock face of Rocha da Pena. The towns of São Brás de Alportel and Santa Bárbara de Nexe, are both small and also demonstrate the fast disappearing Portuguese atmosphere reflecting the rural social style of life. In São Bras de Alportel there is an interesting museum that houses a permanent collection of rural artefacts and costumes truly reflecting the past manner of living in the Algarve.